Sodium bicarbonate, or baking soda, is a molecular compound with several uses in cooking and medicine. 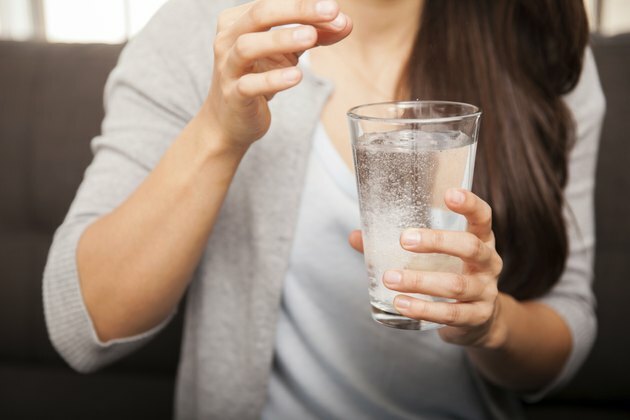 The most common medical use of sodium bicarbonate is as an antacid for relieving heartburn, but it also has applications in treating acute cystitis. Even though sodium bicarbonate can be purchased without a prescription, be sure to check with your doctor before using it to treat a disease. Acute cystitis is a type of infection affecting the bladder or urinary tract, and is commonly known as a bladder infection. Acute infections of the bladder occur when bacteria enter the urethra or bladder and grow out of control, causing symptoms including a burning sensation during urination, abdominal pain and bloody or cloudy urine. Left untreated, acute cystitis can turn into chronic cystitis and cause severe health problems. You can use sodium bicarbonate to treat acute cystitis, either by using antacids such as Alka Seltzer or by taking 1 teaspoon of baking soda mixed with a glass of water. If you use an antacid, check the label to make sure sodium bicarbonate is an ingredient. If symptoms persist for more than 24 hours, see a doctor; you may have a serious infection that needs medical treatment. Sodium bicarbonate is a weak base; it absorbs hydrogen ions and causes solutions to become more basic, or alkaline. Ingesting sodium bicarbonate can decrease acidity in your body and cause the blood and urine to become more alkaline. Passing alkaline urine through the bladder and urethra creates conditions that are less favorable for bacterial growth, and may help to control infections, Cebu Doctor's University explains. Taking sodium bicarbonate may increase sodium levels in your body. Ask your doctor before using sodium bicarbonate to treat acute cystitis if you are following a low-sodium diet for health reasons. Sodium bicarbonate may occasionally cause mild side effects, including stomach cramps, gas and increased thirst. In rare situations, sodium bicarbonate may cause serious side effects, including nausea, vomiting, severe headache, slow breathing and blood in the urine or stools. Stop taking sodium bicarbonate immediately and contact your doctor if you experience any severe side effects.